It’s three weeks since I last showed you my Down the Rabbit Hole quilt, I was hoping to be onto the next border by now but as usual life and other sewing projects got in the way. I’ve decided to stop feeling guilty over my slow progress with hand quilting this quilt, progress is progress, even if it’s just a couple of hours. Though what I really need to do is to try and quilt a little bit every day, even just one thread length a day would make a difference. I was just about half way round the sunflower border. Well I’ve done another Dresden flower and I’ve almost finished another sunflower, so I’m about three quarters round this border now. The straight lines are my basting threads which are gradually fading as I remove them. Fingers crossed I might actually finish this border over the next three weeks!! Please follow the links below to see lots more hand-quilting, I’m sure they’ll have made much more progress than me! I’m also linking up with Kathy’s Quilts for Slow Stitching Sunday, please follow the link for more hand-stitching inspiration. 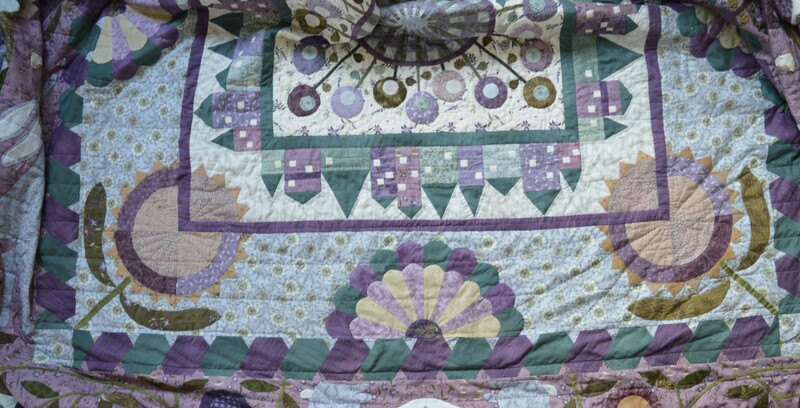 This entry was posted in Quilt-a-long, Quilting, Serendipity and tagged #downtherabbithole, Down The Rabbit Hole, Hand-quilting. Bookmark the permalink. Good luck! It looks like a big job! Doing a needleful of thread a day would actually be a good way to make modest progress every day. Doing a big quilt, I try to do at least three needles, because it takes that long for my hands to loosen up! This is looking great, and I love the radiating lines around the sunflowers. I’m in the same place you are–trying to give myself permission not to feel guilty about not doing more! All progress is commendable! Such a very pretty quilt. Beautiful job on the quilting! Steady progress! As you said, even completing one length of thread is progress. It is looking beautiful. No matter how slowly or quickly this gets done, the end result will be awesome! You are making progress, and have not set it aside! Great work! Yes ..progress is progress even if it’s a thread length, I’m just so pleased you gave it a try! Looking good! 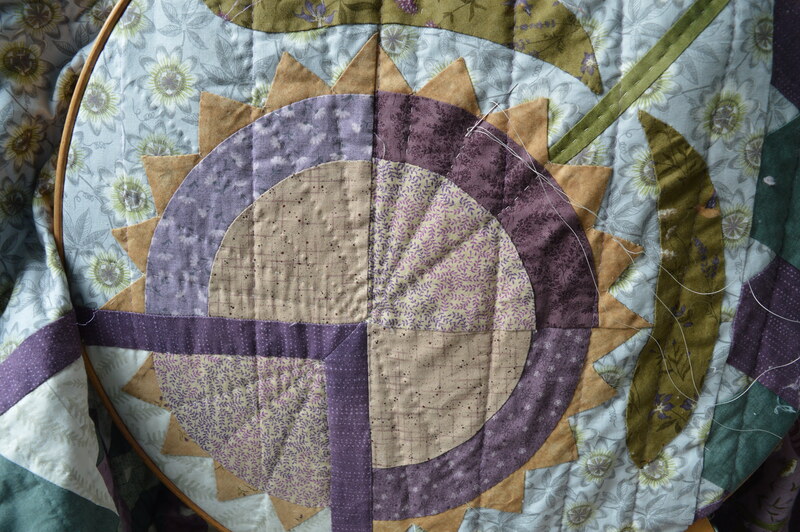 I think those Dresden flowers are my favourite part of the quilt. Your choice of colours & fabrics works superbly! Thanks Claire, I seem to remember lots of angst over the colours of the Dresdens, I think I’ve still got two spares! Every stitch is one more done, and if there’s no set deadline, just enjoy getting reacquainted with each detail!